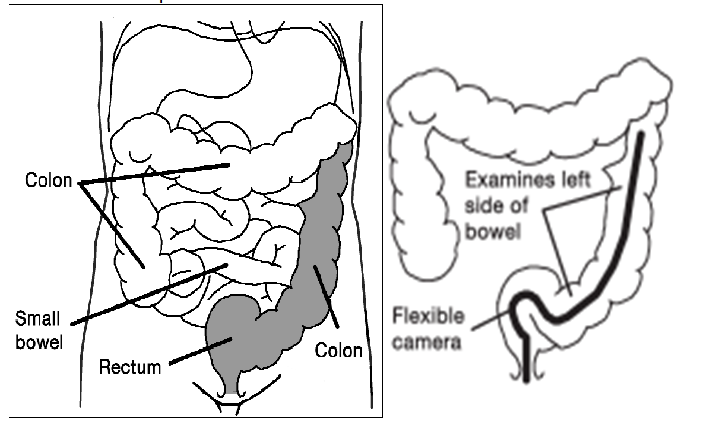 The flexible sigmoidoscope is a special camera, which examines the left side of the bowel. It provides the opportunity to take samples of tissue called biopsies if the endoscopist thinks that the bowel lining looks abnormal. This does not mean that there is a serious problem. The shaded area indicates the usual extent of the examination. Sometimes benign (non-cancerous) growths are found, these are called polyps and are generally removed at the same time. We do know that some polyps, especially large ones, if left for a number of years have the potential to change into cancers. The benefits of this examination are that it is quick (around 5-10 minutes) and examines the part of the large bowel where most bowel problems occur. Most people can carry on with their day or return to work after this examination. It does have its limitations in that it only examines one half of the large bowel. A normal result does not always mean that there is no problem with the large bowel. Therefore, this examination may be part of a series of investigations. 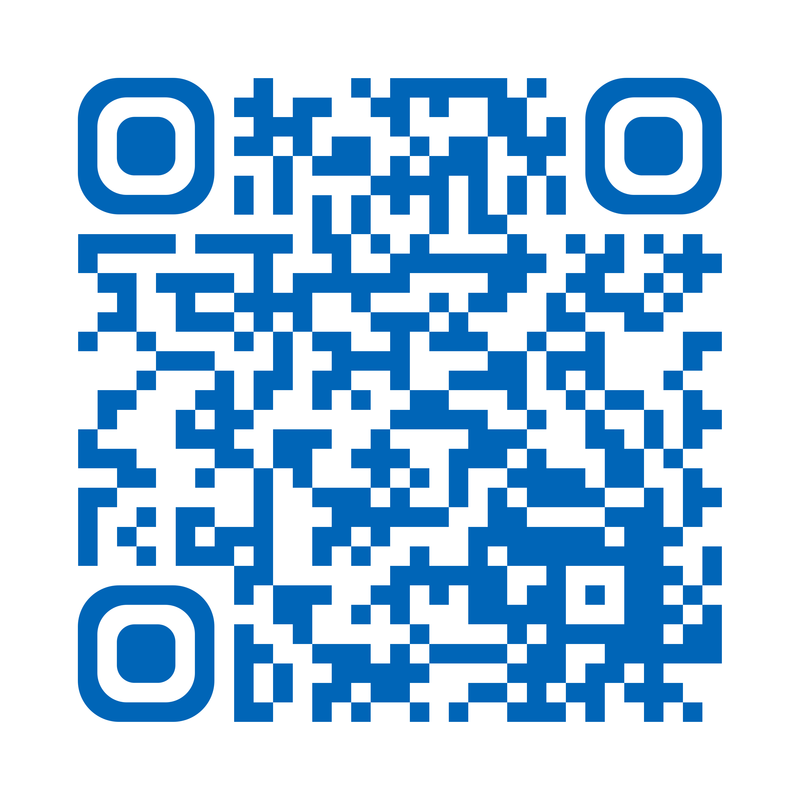 If you have any known allergies or reactions to any medications, please let the endoscopist and/or your nurse know. Serious complications during sigmoidoscopy are rare. Any risks or complications will be discussed with you prior to your procedure. Perforation of the bowel – A small tear may be made through the bowel wall. This is more likely to occur in thin or diseased bowel or when polyps are being removed. If this occurs you may begin to feel unwell, sick and may vomit, your tummy may also become hard, swollen and painful. You may also feel hot and shivery. These symptoms can occur within minutes of the perforation or may slowly develop over a period of days. Bleeding – This can occur especially after the removal of polyps. Although great care is taken to ensure there is no sign of bleeding after a polyp is removed, the contraction of the bowel after sigmoidoscopy when passing wind or opening your bowels can cause the area where the polyp was removed to bleed. If bleeding begins to increase where large clots of blood are seen or you begin to feel unwell or faint, please contact your doctor immediately for advice and help. Recent evidence puts the risk of perforation between 1 in 1000 to 1 in 3000. This can sometimes be accompanied by bleeding. This can be more common with the removal of large or difficult polyps. If these occur this may lead to admission to hospital and sometimes an operation. On rare occasions complications can be life threatening, especially in people with serious and/or unstable cardiovascular or lung problems. It is important to stress that major complications are rare. If you have any of these symptoms YOU MUST CONTACT your doctor, the hospital Endoscopy Department or Ward 100 HRI (out of hours) as soon as possible. Are there any alternatives to this test? Yes, an X-ray examination can be done to show if the bowel looks normal or not, but this cannot always tell us what the problem is or take biopsies. What if I refuse to have flexible sigmoidoscopy? It is your choice whether or not to have the procedure. However this procedure can provide important information about your large bowel that is currently unknown and may be needed to explain your symptoms and plan your treatment. Please discuss any concerns with your doctor/specialist team. Who will do my test? A consultant, senior doctor or specialist nurse who is trained and experienced in performing the test may undertake this for you. Doctors and/or nurses who are undertaking endoscopy training may perform your procedure. An experienced endoscopist will supervise them. Your permission will be requested in advance for this. You may decline and the supervising endoscopist will perform the endoscopy. An Upper GI endoscopy is usually performed in the Endoscopy Department at Hull Royal Infirmary or Castle Hill Hospital depending on where your consultant is based. Please make sure that you go to the correct Endoscopy Department. Directions will be given with your appointment letter. Health questionnaire – Alongside your appointment letter a health questionnaire will be sent; please complete this to the best of your ability and bring a list of any medications to your appointment with you. This forms an important part of assessing your ‘fitness’ for sigmoidoscopy and reducing the potential risk of complications occurring. Please read this information leaflet. Share the information it contains with your partner and family (if you wish) so that they can be of help and support. There may be information they need to know, especially if they are taking care of you following this examination. Complete the health questionnaire as fully as possible and bring it with you. To be able to see the lower part of the large bowel, the area will need to be free of faeces. Instructions for your bowel preparation are enclosed with this information. If you have any special needs, disabilities or personal reasons for not being able to manage your enema please contact your Endoscopy Department so that alternative arrangements can be made. If you have diabetes, a serious heart, lung or kidney problem or are concerned that a health problem that you have may be affected, please contact the Endoscopy Department at the hospital where you are having your examination (see contact numbers). If you take any of the following blood thinning tablets please contact the Endoscopy Department before your appointment for further advice: Warfarin, Apixaban, Rivaroxaban, Dabigatran, Argatroban, or Edoxaban. Clopidogrel (Plavix) – Please inform the Endoscopy Department if you are taking these tablets as these may need to be stopped prior to your procedure. Iron Tablets – If you have been asked to take ‘picolax bowel preparation’ you must stop your iron tablets 7 days before your test. Insulin – For some people with diabetes, we may need to admit them to hospital for the day and night before the test. There is a risk that the bowel preparation for the examination and restricted diet could make the control of your blood sugar difficult and make your diabetes unstable for a short period. Pacemaker – Please contact the department if you have a pacemaker. Latex – Please inform the Endoscopy Department if you have a confirmed latex allergy as this will affect your appointment time. Creutzfeldt-Jakob disease/variant Creutzfeldt-Jakob disease (CJD/vCJD) – Please inform the Endoscopy Department if you have been notified that you are at risk of CJD/vCJD for public health reasons. If your health changes whilst waiting for this examination, please inform your Endoscopy Department. A nurse will collect you from the waiting room and explain what will happen next. You will be given an approximate time of when you may be collected to go home. It is advisable to leave any valuables at home. Occasionally there may be a delay in your appointment time, due to an emergency taking place. If there are any delays you will be notified as soon as possible and be kept informed. We will ask you questions about your general health and work through the health questionnaire that you have completed for us. Please feel free to ask questions. The endoscopist will meet you and explain the examination to you. You will both sign a consent form and discuss any risks or complications. This is to show that you understand what will happen and that you agree to the procedure being performed. If you have any queries or worries, please tell us at this stage. Due to the nature of the examination we ask you to undress and change into a hospital gown, your belongings will be put in a plastic bag and will be with you throughout your stay. A private changing area is provided and although a gown and privacy shorts are provided, you may also wish to bring a dressing gown with you. If you need glasses to read, please keep them with you at all times. Do not leave them with a relative or in a bag or pocket. There will be a nurse or assistant in the room with you. We will check your blood pressure, temperature, pulse, and oxygen levels before your sigmoidoscopy. Once on the examination trolley you will be asked and helped to lie on your left side with your knees tucked up as close to your chest as you can. This will help the camera pass through the first few bends of your bowel. You can watch the examination on the TV screen if you wish. Do not hesitate to ask questions during the examination. Following the procedure you will be taken on the trolley into the Recovery Room where you can rest on your side for a short while to enable you to pass the air that is still remaining within your colon. When you are ready you will be able to get up and dress before you are assisted to the second stage recovery area where you will be offered a drink before being given your discharge information and any available results. To help get around the bowel; air is gently passed into the bowel through special channels within the camera. To help the camera pass through the bowel, the endoscopist will examine your bottom first with a finger. This applies lubricating jelly (which may feel cold) to the bottom but also allows the endoscopist to feel the first few centimetres of the bowel. This part is sometimes not seen by the camera. Air opens up the bowel so that the endoscopist can see where he/she is going. This will cause the bowel to stretch. The first feeling is usually a feeling of wanting to go to the toilet. You will be convinced that you need the toilet. Please do not worry; you will not make a mess. It is just the stretching of the bowel and usually settles down as the camera travels further into the bowel. However, bloating and sometimes a tightening of the tummy muscles often replace this feeling. This varies from person to person. It can catch you by surprise. Instinct tells you to hold your breath until it passes. Please try not to and to breathe normally and steadily. The feeling does not last very long and disappears once the examination is finished. Your nurse will help you through the examination. If it becomes uncomfortable let us know so that we can stop; remove some air and then carry on the examination. Most people find that this works and they are able to tolerate the examination until the end. Some people do not tolerate this test very well due to a variety of reasons or the test may be too uncomfortable. You do have the right to withdraw your consent at any time. If you wish us to stop, tell us and the examination will be stopped. In the recovery area you will be told what has been found, if any biopsies/ polyps have been taken and what happens next. Sometimes further tests may be needed or follow up with your specialist will be arranged. Biopsy results take up to 7 weeks and will be discussed with you at your clinic follow up. If the examination is normal and no other investigations are needed you may be discharged back to the care of your doctor.